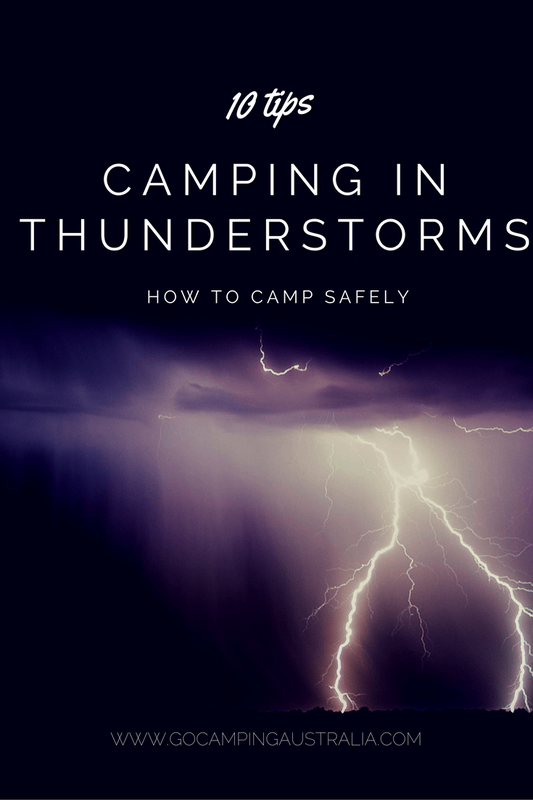 If you are caught in a thunderstorm when camping, you need to know what to do. Whilst it remains highly unlikely you will be hit, or somewhere near you get hit, it’s better to know what to do and not do. Ideally, you should have checked the weather before you left, but weather is unpredictable and you may not always have had this information prior to your trip. Your preferred option is always to take cover in an established building like a house, hut or some other building. But frequently when camping, that's not that easy to find. That's why you should read our tips for camping in storms. 1) In the event of a thunderstorm, a safe vehicle is the best option. That’s a fully enclosed car/van/truck with a hard topped roof. A convertible is not a safe vehicle. Why is a car safe? Well, its not the tyres as is commonly believed. It’s the Faraday Cage Phenomenon “Lightning will travel around the outside of a metal-framed vehicle, essentially protecting the passengers within from electrical shock” Just don’t touch door handles, and turn off equipment, and keep hands in lap. 2) If you are in a tent, get out of it and go to the safe vehicle. This is preferable to say a picnic shelter/gazebo. Even though many tents don’t have metal poles these days, the power of a lightning strike would certainly be felt. No tent offers any protection regardless of its construction and materials. 3) If hiking or camping away from your vehicle, avoid high ridges/peaks/higher ground in general. Get down to lower levels as soon as you can and crouch as low as you can on the ground, but just on your feet (don’t stabilise yourself with hands on the ground). 4) On flat terrain, avoid anything like trees and bushes as they are higher – look for a ravine or depression to take cover in. Lightning is unpredictable but if you are the tallest thing on a field or campsite, it puts you at risk – so move out and find lower ground. Then get down low and take crouch (as in point 3). 5) If you are in a group, and are sheltering (not in a car) but in the open, spread out where possible. Because in the event of someone being hit, it reduces the chances of others being injured as well, and you will need those people to provide aid and/or go for help. 6) Being on naturally wet ground really makes no difference to standing on dry ground, but don’t stand in water! 7) Small caves/big boulders are not safe options. Lightning can jump from the top of the gap to the bottom of the gap, passing through you. 8) 30 minutes after the last thunder rumble is when it is considered safe to come out of whatever location you took cover in. 9) Don’t take cover near metal objects like fences and poles. Consider that when seeking cover. And wet ropes are excellent conductors of electricity, so hikers/climbers need to discard them before seeking shelter. The current from a lightning strike can carry for a long distance. “When thunder roars, go indoors”.